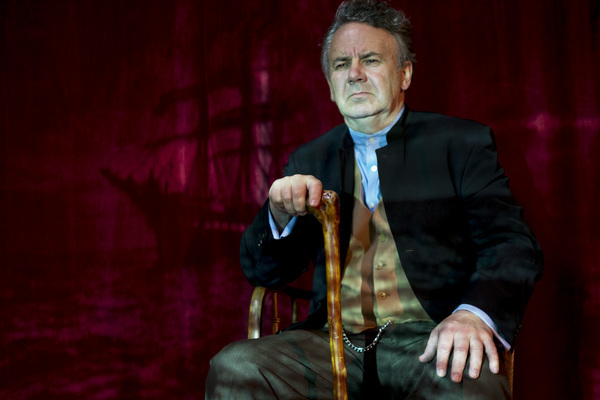 UNTOLD VOYAGE: Michael Veitch as great, great-grandfather James William Henry Veitch in his new, one-man play Hell Ship. One-man play Hell Ship is more than an untold saga of a heroic naval surgeon on a nightmare voyage, to actor Michael Veitch. “For me, it’s also a love story – my family was born of this tragedy,” he said. At age 10 he first heard the story of his great, great grandfather, James William Henry Veitch, who was a surgeon on the typhus-infested migrant vessel Ticonderoga. In 1852, the ship limped into Port Phillip Bay after a nightmare voyage from England, in which about 100 of its 800 passengers and crew died from typhus. “It just went nuts in the hull of this crowded ship,” Veitch said. Sharks reportedly followed the stricken vessel across the Indian Ocean as Scottish settler families cast their dead loved ones overboard. Young James bravely nursed sick passengers back to health before the ship reached Victoria. At Queenscliff authorities stopped the Ticonderoga and forced it to anchor at Portsea, in a bay that now bears the ship’s name . A further 100 or so passengers died in a makeshift quarantine station made from the ship’s sails near the town. When news of the ‘fever ship’ reached Melbourne, the city went into a panic. Special editions of newspapers told the grisly story of the ill-fated vessel to transfixed readers. “It was a massive story in its day – the press went ballistic against the government,” Veitch said. James came from “a very well-to-do family of navel surgeons” and had planned to return to England, Veitch explained. But on the ship he met Scottish lass Annie Morrison, Veitch’s great, great-grandmother, who had lined up work with a Bellarine Peninsula wool farmer. “They met in the adversity of this awful voyage and they stuck together,” he said. They married and settled in Victoria, where they lived happily for the rest of their lives. But Australian history “quickly and deliberately” forgot the story of the Ticonderoga, Veitch said. He read newspaper articles, letters, and historical records in Victoria and England to bring James’ story to life for his one-man play, Hell Ship. “I really had to hunt for it,“ he said. Veitch looked forward to bringing the play to the Potato Shed on 7 September. “To do it somewhere close to where it actually occurred is quite special,” Veitch said. Veitch, who has appeared on TV shows like Full Frontal and written books about World War II veterans, described acting alone as challenging. “It makes the dressing room a little bit lonely at times,” he said.